One of the ways that French people great each other is with a kiss (no, not a French kiss!). Depending on the region, you kiss each other on the cheek, or more correctly touch cheeks and make a kissing noise, two to four times. It’s called the bise (sounds like bees) and is short for bisou (bee-zoo), or kiss. 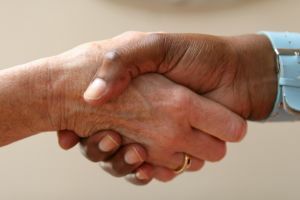 Women do the bise to other women and to men, but men only shake hands unless their very good friends or family. Either way, there is always physical contact when people see each other. To illustrate how important and pervasive this cultural habit is, I’ll tell you this story from yesterday. I was driving home from the grocery store and the car in front of me actually stopped, in the middle of the road, so that the driver could do the bise with a guy walking down the street. It’s like waving to people you know, but holding up traffic at the same time! People just have the reflex to do the bise with others which is why, when you break the convention, it’s a bit disconcerting. I’ve been sick lately, and beyond not wanting to give others my cold, our new workplace precautions against the H1N1 flu bug advise against touching others. So no bise for me, which means that people have a bit of a jolt when I back away from them. “No bise? OK!” they say, waving their arms in front of their faces. “Pas de problÃ¨me!” They agree, but they have to think about it for a minute first. It’s made me think about how much harder it is to live the frugal life and try not to spend a lot of money when we live in a society that encourages such a large amount of consumption. There is a trend towards frugality at the moment, but I wonder how long it is going to last, when all we hear is: Cheaper. Better. Newer. More. France isn’t quite as overboard as the United States when it comes to consumerism, shopping, buying and buying more, but the push towards buying and having more and more exists and is getting stronger. There are clothing store chains that have sales like ‘Buy one, get four free’ which adds a whole new twist to the BOGO offer! I find it easier to be frugal when I’m with other people who are frugal. Many of my friends are also trying to save money, live within their means and so on. Part of this is due to circumstances (most of us have young kids, and don’t have the energy to do much shopping, let alone the money) and part of it is due to conviction (paying off credit cards= good; carrying debt= bad). Changing the habit of spending money heedlessly is something that most of us have been working on for a while. We might not be perfect at it (not yet, anyways), but it’s getting easier, at least for me. I’ve stopped buying things online, stopped shopping as a hobby, started grocery shopping from a list. I don’t have expensive hobbies anymore, don’t buy DVDs or CDs, go out to concerts and movies. There are still two big areas where I need to improve. The first is eating out at fast food restaurants, because I haven’t planned a real meal and we’re stuck for time (or I think we are, at least!). The second, is that little voice in the back of my head that says “It’s OK, you can always put it on the credit card and pay it off later.” I don’t, but like doing the bise, it’s a habit that’s hard to break! And you? What bad financial habits have you been trying to break? My worst frugality trait is my “feast or famine” mentality. Sometimes I’m really dedicated, and can keep spending down to just about nothing. But when I slip, look out! It becomes a “who cares” scenario, and I completely lose touch with my frugal side. What I wouldn’t do to be more “middle of the road”…. .-= Emily´s last blog ..It’s Funny…or not =-. One of the biggest things that has helped me with not slipping when we are out and it’s getting close to a meal time, is to know that there is something in the freezer that can be thawed/cooked in a matter of minutes. Every once in a while I will load up the freezer with items (including frozen homemade bean burritos and homemade breakfast burritos) and these can be microwaved in 2 minutes and voila, a meal without spending. Hope this helps you, it has drastically reduced our grabbing something while we are out. I do really think we are prisoners to our habits. They can either make us or break us. My bad habit is falling for those "sales". Gee – buy one get one free sounds so enticing but is it really a deal when I do need it all. Not only do I fall for sales of big ticket items but also for small items like groceries. I see a large red sales sign next to a bag of cookies and I'm a sucker even when I may be only saving 20 cents on a $3 bag of cookies! .-= [email protected]´s last blog ..Save Money by Building a More Effective Shopping List =-. Agree, especially being in mid 20’s and wanting to have fun and live in the moment it is more difficult to balance that with saving and spending frugally. .-= Amy Reads Good Books´s last blog ..The Senator’s Wife =-. I think very often with spending, one thing leads to another. I had a nice little appraisal job that brought in some unexpected money in August. I celebrated by buying some new bras–a nice treat because I hadn’t bought any in several years and mine were becoming misshapen. After that, I began to think, “I really could use a good pair of shoes,” or…. I had to remind myself that “could use” is not the same thing as “need,” and I’d better not go there. It’s a good thing! My laptop’s hard drive just crashed, and I’m looking at hundreds of dollars to repair it and save the data. I would have felt pretty bad if I’d indulged myself more than I did. Ahhh, the big fly-swatter that follows us all around constantly! I am still recovering from my early twenties continuous credit card shopping spree. The habits I am now trying to eliminate is not rushing out to buy something when my daughter “needs” something. Instead I wait a couple of days and reassess the situation to see if she can do without. And most of the time she can (surprise, surprise). And if she cannot, we can usually pick it up second-hand for a fraction of the price! .-= jennifer888´s last blog ..Negotiating for Moms =-. Well, it’s a sad truth that when you’re young, you hardly think of the importance of saving cash, or spending wisely. I have been lucky to meet a few people who helped me towards the right financial direction. Defining necessities, simplifying my lifestyle, and eating healthier have become 3 fundamental rules I live by today. I take note of discounts now, and stop feeling silly about being frugal. My advantage is that I have the internet, and I can do all my shopping online on great discount sites like http://www.savingswatch.com. I get freebies, free shipping, and cash back rewards. These are a few of the things that makes saving cash easier! Next post: Movie Theater, Rentals, Cable or Free TV?